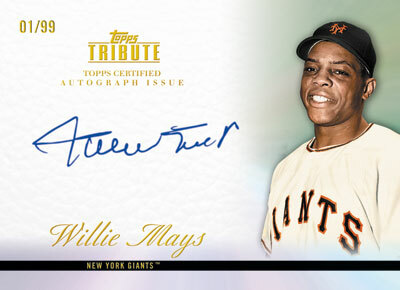 The 2012 Topps Tribute Baseball sell sheet and promotional images already let the word out, but Topps has formally announced they've come to an agreement with all-time great, Willie Mays. Under the multi-year agreement, Mays' autograph and memorabilia will be used in Topps products. The first Mays signature cards under the deal will be in 2012 Topps Series 1 Baseball, which releases in February. He will also have autographs in other early-season releases such as 2012 Topps Tribute and 2012 Gypsy Queen Baseball. Outside of cut signature cards, autographed Mays cards were last seen in 2008 with Donruss.